Cixin Liu is a Chinese science fiction writer, described as the country's most prolific and popular. 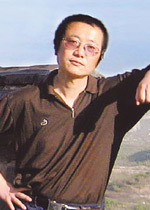 Cixin is an eight-time winner of the Galaxy Award for science-fiction writing. Prior to his success as a writer, he worked as an engineer in a power plant in Yangquan, Shanxi. Note: Cixin is the given name (pronounced sea-gin), Liu is the family name (pronounced l-yo).